Here is the first polish from OPI's upcoming Euro Centrale Collection that I have to share with you! This collection will be available on February 6th, and I will be reviewing a few shades over the next little while. You're Such a BudaPest* is described as a periwinkle-purple, and I definitely agree. First things first, the application of this polish was somewhat disappointing. I have grown to love OPI's amazing formulas, needing only two coats for full coverage. However, with You're Such a BudaPest, I needed 4 coats. Four coats! And even then, my nails were left looking slightly streaky. I need to try this one out using OPI's Ridge Filler, maybe I would be left with better results. 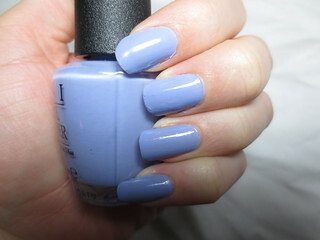 Other than the formula, the colour is very pretty, almost reminiscent of OPI's Do You Lilac It? You're Such a BudaPest is a beautiful deepened lilac with blue undertones. I think that this shade is a great inclusion in a Spring Collection! I know that we are still in the cold Winter months now, but I do fancy a change from the typical deep, dark, mysterious shades that are common this time of year. Besides the troubles with application, I did find that this polish wore quite well. I'm writing exams now, and I don't have time to paint my nails as often as I would prefer. So, I'm really happy that this polish didn't chip or show tip wear over the four days that I was wearing it. Also, considering I used four coats (plus base and top coat), this polish dried quite quickly! I did use OPI's RapiDry Spray, which is an incredible product, but You're Such a BudaPest did dry faster than most polishes. Is this color any similar to China Glaze Secret Periwinkle? I haven't tried any China Glaze colours, sorry!